Sophie read ASNaC and History of Art at the University of Cambridge and then trained as a conservator at the Institute of Archaeology, University College London. She specialised in the conservation of organic artefacts while working at the British Museum, and developed a sub-specialty in conserving Egyptian polychrome objects, particularly cartonnage. She is especially interested in creative mounting methods for fragile objects. She has been conservator at the Polar Museum, Cambridge since 2012 and in early 2017 she spent a field season on Horseshoe Island in Antarctica cataloguing artefacts in the historic 1950's base there. Many collections in the UK include some radioactive objects, which must be managed in accordance with the Environmental Permitting Regulations and the Ionising Radiation Regulations. These laws are complex and cover a wide range of industries so it can be difficult to work out how they apply to museums in practice. Museums in the UK also have to consider how to integrate their legal obligations for working with radiation with accepted museum ethical guidelines, SPECTRUM 5.0 and the Accreditation Standard. This paper aims to illustrate how radioactive objects can be practically managed in a small museum context through examples from the Polar Museum in Cambridge, where the Radiation Protection team and the conservator have worked closely since 2009 to develop robust procedures. It covers many collections based activities including display, storage and conservation, and discusses these in the context of recent updates to UK law. A risk assessment template for working with radioactive collections is included as an Appendix. 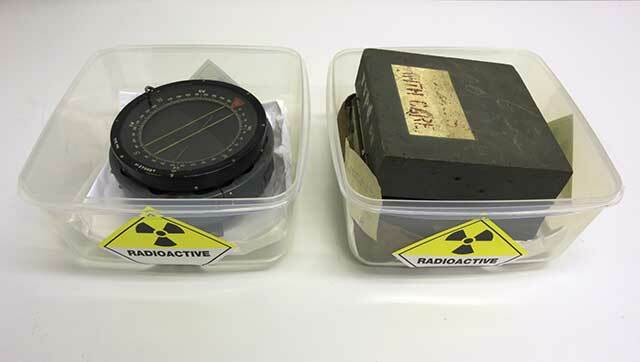 Many collections contain radioactive objects, but it can be difficult for smaller museums to find sources of information about managing them in practice. 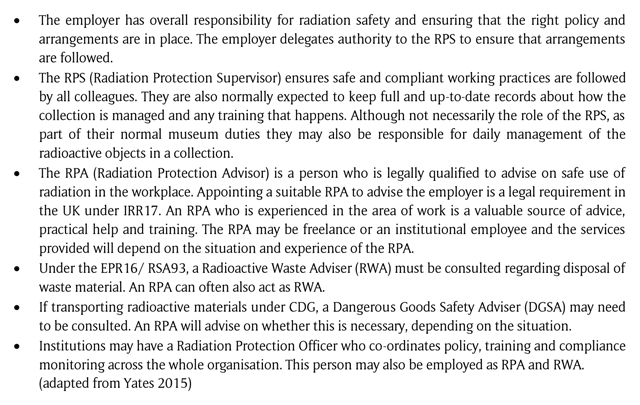 Laws relating to work with radiation are complex and deal mainly with situations very different to normal museum contexts, making it difficult to find the parts important for museums to follow. Museums in the UK must also integrate their legal obligations for working with radiation with accepted museum ethical guidelines, SPECTRUM 5.0 and the Accreditation Standard. Some museums have extensive radioactive collections whose large scale dictates how to manage them (Freedman 2011; Kerbey and Horak 2006). However, smaller museums with only modest numbers of radioactive artefacts must still comply with UK law. Collections management procedures for large radioactive collections may not be relevant to small museums with limited resources, yet there is little published information aimed specifically at small collections. This paper aims to illustrate how radioactive objects can be practically managed in a small museum context. It uses concrete examples from the Polar Museum in Cambridge to show how complex legal requirements can be met with relatively few resources. This paper is timely because of recent changes to the main UK legislation governing radioactive materials in museums – the Environmental Permitting Regulations (Environmental Permitting Regulations 2016) and the Ionising Radiation Regulations (Health and Safety Executive 2017). The Polar Museum is part of the Scott Polar Research Institute in the University of Cambridge. It holds around 7500 artefacts and artworks, of which 15 are radioactive. The University of Cambridge includes numerous departments using radioactive sources for medical, biochemical and other research, and therefore has a Safety Office with several full-time radiation experts. The Polar Museum receives excellent support from the University Radiation Protection Adviser (RPA) and Radioactive Waste Adviser (RWA), who also advise other University museums with radioactive artefacts. Since the Polar Museum artefacts were identified as radioactive in 2009, the museum conservators and University Radiation Protection team have worked closely to develop collections management procedures based on first principles, namely the legal requirements for working with radioactive material combined with UK museum standards. The procedures include risk assessment, regular audit, display and conservation treatments. This paper presents these activities in detail, focusing on the interpretation of UK law. The general principles are widely applicable, although readers outside the UK are recommended to seek specialist advice on laws in their own region, since penalties for failing to comply can be severe. The Environmental Permitting Regulations (EPR16) focus on waste management and controlling pollution in the environment (Environmental Permitting Regulations 2016). EPR16 applies in England and Wales and is enforced by the Environment Agency. Scotland and Northern Ireland have the Radioactive Substances Act 1993 (RSA93), enforced by the Scottish Environmental Protection Agency and the Northern Ireland Environment Agency. All three environment agencies have similar powers to the police to inspect private property and bring prosecutions. EPR16 was completely revised in 2016, and radioactive substances are covered in Schedule 23. Some museum collections require a permit under EPR16, although certain items can be held under the ‘exemption regime’. In 2011, the UK Environment Agencies issued a guide to exemptions for UK museums (UK Environment Agencies 2011) (see also section 3.4). Even collections not needing a permit must still comply with the rest of the regulations, keeping sources secure, documenting and labelling them and abiding by the law on disposal. The Ionising Radiations Regulations 2017 (IRR17) replace regulations from 1999, and focus on user safety (Health and Safety Executive 2017). IRR17 is enforced by the Health and Safety Executive (HSE), which can prosecute under the law (Health and Safety Executive 2015). IRR17 is aimed at UK users of ionising radiation in any work context and so applies to museums as well as industrial, medical and research facilities. IRR17 is more familiar in the museum sector as it covers X-ray and UV-light sources and some analytical instruments, as well as radioactive collections. The biggest change affecting museums in the updated IRR17 is a new graded system based on risk (Regulations 5–7), explained in more detail in section 3.3. The IRR17 publication L121 incorporates an Approved Code of Practice (ACOP) with clear and detailed guidance about how to comply. All museums holding radioactive artefacts must comply with IRR17, regardless of size or EPR16 permit status. Objects from the 1930s–70s with luminous radium or tritium paint on dials, like watches, compasses, firearms with luminous sights and aircraft instruments. Earlier objects refurbished in the 1930s–70s may also be radioactive (Spory 2012). Scientific and medical equipment, including some quack remedies. Aircraft and camera components containing thorium alloy. Green glass coloured with uranium oxide from the nineteenth century onwards, e.g. in beads on ethnographic objects (Swift et al. 2012). Some nineteenth-and early twentieth-century glass and ceramic glazes contain uranium oxide, e.g. some tiles, sandwich glass and Fiesta ware (Boyle 2003, Vandiver 1995). If part of a collection is suspected to be radioactive, first contact a Radiation Protection Adviser (see Figure 1) as is legally required under IRR17 (Regulation 14 and Schedule 4). The RPA2000 website (http://www.rpa2000.org.uk/list-of-certificate-holders/) includes lists of accredited Radiation Protection and Radioactive Waste Advisers, and emergency advice is available from Public Health England (https://www.phe-protectionservices.org.uk/rpa). Universities often have their own RPA, and local authorities may have existing contracts for RPA services. IRR17 Regulation 14 requires that a “suitable” RPA is consulted, with relevant previous experience (Health and Safety Executive 2017, pp. 59–61). Who’s who in radiation protection. The RPA can identify which objects are radioactive and advise in detail how to manage them. It is important to discover quickly which radionuclides are present and what their activity is (see Figures 2 and 3). This information is essential for arranging permits if required and for establishing safe working practices. The radioactive artefacts at the Polar Museum were identified in 2009, and their output measured then. The objects all contain either radium-226 or naturally occurring uranium. Total activity from the radium-226 painted artefacts is estimated at 7 MBq. The half-life of radium-226 is 1600 years and the radionuclides in naturally-occurring uranium decay over millions of years, so effectively any measurement stays the same and does not need repeating. The museum has records of individual activity for every artefact, which is essential for assessing radiation doses from work with the objects (see section 4.2). By law, HSE must be informed about proposed work involving radiation, which must not be done until the application is approved (see HSE website). IRR17 has introduced a 3-tiered system based on risk. The three levels are “Notification” (lowest risk), “Registration” (medium risk) and “Consent” (high risk). The risk category depends on the exact amount, type and activity of the radioactive substances, which the RPA will assess at the outset. The Polar Museum collection, although small, has to apply for registration because most artefacts contain radium, which is highly radiotoxic. This means even very small quantities require registration, where the same amount of other substances presents a lower risk. As well as type and activity of radioactive material, it is important to know whether sources are “sealed” or “unsealed”. A sealed source is defined in EPR16 as “a radioactive source containing radioactive material where the structure is designed to prevent, under normal use, any dispersion of radioactive substances” (p. 212). The amount of radioactivity and type of source together determine whether museums need an Environment Agency permit, and the RPA can advise in detail. Table 1 gives examples of types of object commonly found in museum collections and thresholds for needing a permit. Summary of permit requirements for common museum object types. Most Polar Museum objects are compasses and watches with radium-painted dials. Some paint is open to the air and clearly “unsealed”. In many other cases the paint is under glass and could be considered “sealed”. However, seals on the compasses are gradually deteriorating and letting air into the liquid round the dials, indicating that the paint is not necessarily “sealed” to modern standards. Radioactive liquid or dust could leak out if the glass breaks or the seals decay catastrophically. So, for the purposes of the Environment Agency permit, the artefacts are all considered “unsealed” sources. The Polar Museum permit is held jointly with the Whipple Museum of the History of Science because both are University museums with similar collections. The total activity of both collections is estimated as 20 MBq, but the permit is for up to 25 MBq. This leeway allows both museums to acquire radioactive objects, or discover previously unidentified ones in the collection, without having to apply for a new permit. Once radioactive artefacts are identified, someone must be appointed Radiation Protection Supervisor (RPS) to take responsibility for safe working practices (see Figure 1). In most museums, this is a collections manager, conservator or possibly curator, rather than a director or trustee. It is not usually appropriate for the RPS to be a volunteer. The RPS must demonstrate how collections are being managed appropriately if asked, so should be someone practically involved with this on a daily basis. The RPS must be trained in managing radioactive material and the RPA can recommend or provide this training. Radiation can be a significant health hazard and mention of “radioactivity” in a museum context may cause anxiety. It is essential to understand exposure risk from a specific collection so that management strategy is appropriate to the level of risk. Radiation can cause both deterministic (or threshold) and stochastic (or probabilistic) health effects. Deterministic health effects are predictable, occur above a certain threshold and increase proportionally with amount of radiation exposure. For example, very high radiation doses above certain thresholds predictably cause burns in everyone. Stochastic effects are those caused by radiation which appear in some people and not others, e.g. some cancers. Because these effects are unpredictable, it is impossible to set a safe threshold for radiation exposure (Goodman 2010). In practice this means people working with radioactive artefacts need to keep exposure as low as reasonably practicable (ALARP). ALARP (sometimes called ALARA) should always inform any activity involving radioactive artefacts and is legally required under IRR17. Radiation doses from work with artefacts depends on several factors, including type of object, where the radioactive portion is, radionuclide and type of emissions (see Figure 2), time spent with the radioactive source, distance from the source, and body part exposed to radiation. Detailed information for all radionuclides and routes of exposure is given in Delacroix et al. Typical museum tasks give different exposures, depending how they are done. For example, staff working in a storage area very close to radioactive objects may be exposed to gamma and beta radiation even without touching the artefacts. However, even a metre away from radioactive objects the gamma level is much lower and beta radiation is significantly reduced. Handling objects directly gives a much higher dose, especially from beta particles, and examining them closely can expose the eyes, which are very sensitive. Alpha particles are very damaging if ingested or inhaled, with the greatest risk from artefacts deteriorating and shedding material, or from contamination due to an accident or sloppy handling. It is important to understand exposures in context. Background radiation is present everywhere in nature, and on average in the UK a person is exposed to 1 microsievert (μSv) of external radiation every 4 hours (see Figure 3) (Yates 2015, Watson et al. 2005). In Cornwall— a popular holiday destination-average daily exposure is almost 3 times this. By comparison, spending one hour per year doing a visual inspection of the Polar Museum collection (section 6.1) gives an external whole body dose of 20 μSv, equivalent to spending 1.5 days in Cornwall. Comparisons like this can be reassuring, but do not mean the risk can be ignored. If in doubt, always consider ALARP. “Dosimetry” means devices worn by radiation workers to monitor their exposures over time. There are numerous types, including badges which measure whole body exposures and fingertip monitors that register exposure to extremities during handling. Unlike for large collections, exposures arising from normal work with small numbers of artefacts may low enough not to show up on dosimeters. This is true at the Polar Museum, so dosimetry is not required for routine procedures. An RPA can advise on choosing the right dosimetry. IRR17 Regulation 18(1)–(2) requires every employer to establish “Local rules” for working with radioactive material. These should give very clear guidance on how to do specific tasks safely in a specific site. Local rules may be detailed and complex or relatively straightforward depending on the task and workplace, but they should be appropriate to the risks and realistically achievable. Thorough consultation with the RPA is essential to develop good local rules for a collection. A summary of the working instructions appropriate to the radiological risk associated with the source and operations involved, including the written arrangements relating to non-classified persons entering or working in controlled areas (regulation 19(3))” (IRR17 p. 83–4). Point (f) refers to museum spaces where work with radioactive collections happens, which must be designated either as “controlled areas” or “supervised areas” and clearly signed. The designation depends on the risk, based on specific objects, tasks and spaces in the museum. “Controlled” areas are used for higher-risk tasks. According to IRR17, non-classified workers entering controlled areas must comply with a written system of work to restrict exposure. Classification of workers is required for higher-risk work, based on risk assessment and consultation with the RPA, and “workers” may be employees, researchers, students, or in some museums, volunteers. To restrict access, controlled areas must be physically segregated from the rest of the workplace. A “supervised” area is required where external exposure risk and risk of contamination are lower, but the area is still carefully managed to limit exposure for everyone using the space. Local rules are still required. At the Polar Museum, the radioactive collection is kept in a “controlled” area because the external dose rate close to the collection exceeds 7.5 μSv per hour (IRR17, ACOP 17(1)). Occasionally, the conservation workshop is designated as a temporary controlled area, when the collection is actively handled for inspections or conservation treatment, because of the risk of accident (dropping and breaking an object) or potential contamination from the artefacts. A risk assessment for any work with radiation is required by law (IRR17 regulation 8), and must be done before starting work. The risk assessment should also be recorded. A radiation risk assessment is more complex than most standard risk assessments because it must consider many factors including exposure (whole body, extremities, from ingestion and inhalation); dosimetry; need for PPE and/or shielding; control or supervision of work areas; correct disposal of radioactive waste and reducing risk and spread of contamination. The Polar Museum uses a risk assessment template devised by the University of Cambridge Safety Office for all work involving radiation. The template prompts the RPS to record every factor, even when the issue is not applicable. For example, few procedures at the Polar Museum produce any radioactive waste. Using the template ensures the assessment is complete and robust, and also provides a record of due diligence in case of an Environment Agency or HSE inspection. The risk assessment also gives clear information about exposures to staff before they undertake a procedure. An annotated version of the template is in Appendix 1. Time for the conservation treatment – generously estimated at 30 minutes (or 0.5 hour). Activity of the object (calculated by the RPA, and based on the radium-226 gamma ray constant of 227 μSv/h/GBq at 1 m) – 0.8 Mbq. Dose rate for radium-226 is 1.3e-5 mSv/MBqh for a penetrating deep-tissue gamma radiation dose, assuming the source is a point 30 cm away (Delacroix et al. 2002 p.147). External skin dose from beta radiation from radium-226, again assuming a point source 30 cm away; dose rate is 6.3e-5 mSv/MBqh. Hand dose while handling the object based on the calculated dose rate of radium-226 enclosed in a plastic syringe, given as 2.6e-2 mSv/MBqh. 0.5 hours × 0.8 MBq × 1.3e-5 mSv/MBqh = 0.52e-5 mSv (or 0.005 μSv). 0.5 hours × 0.8 MBq × 6.3e-5 mSv/MBqh = 2.52e-5 mSv (or 0.025 μSv). 0.5 hours × 0.8 MBq × 2.6e-2 mSv/MBqh = 1.04e-2 mSv (or 10.4 μSv). When added together, these figures indicated very low levels of risk from external exposures (skin and hand dose limits are 500 mSv/year, whole body 20 mSv/year). The assessment process is useful for thinking through details of the procedure, modifying them to make it safer, and highlighting the importance of control measures. The Polar Museum has risk assessments for every different task involving the radioactive collection, because the exposures vary significantly depending on which objects are involved and the procedure. It is important to remember that radiation exposures are cumulative and so staff members’ whole annual exposure from all procedures is factored in when assessing risk. Preventing spread of contamination from objects is paramount, so handling practices at the Polar Museum are meticulous. Containing artefacts in trays or bags helps keep a clean workspace and store (see also section 7.5). When objects are directly handled, the work surface is temporarily covered with a generous disposable polyethylene liner to prevent dust and small particles getting stuck in crevices and contaminating them. Nitrile gloves are always used for handling and discarded immediately to prevent contamination being transferred onto other surfaces. Most work at the Polar Museum generates no radioactive waste, except very small quantities from conservation (see section 9). This solid waste is double-bagged and stored in a controlled area and removed as soon as possible by the University radioactive waste disposal team. The most waste ever produced at the museum had a measured surface activity of 300 Bq, which is a very low output and can legally be disposed of to landfill. However, the museum lacks facilities to measure activity from waste in-house and so still needs the Radioactive Waste Adviser to confirm actual activity and dispose of waste correctly. The RWA provides a receipt for the waste removed which is kept as a record of compliance. IRR17 (Regulation 29) requires regular audit of radioactive material so that thefts or losses are promptly identified. Keeping full records of objects is also required under EPR16 whether they are held under a permit or a conditional exemption. Each radioactive source must have a unique identifier, measured activity and a known location. Happily for museums, these requirements overlap very neatly with normal collections management standards where artefacts have unique accession numbers and known storage locations. Once measured by the RPA, activity for each artefact usually stays constant. Audit and record-keeping are therefore inherently straightforward in a museum context. The RPA will advise on how often the collection should be audited, based on factors including frequency of object movement and risk of loss or theft. At the Polar Museum, the objects are audited quarterly and records are tabulated for quick access (although in some museums this could equally be managed through the collections management database). The process of checking that all objects are present takes around 10 minutes and audit records are kept for at least 2 years. For a large collection, this frequency of audit would not be practical or in line with ALARP, so any audit protocol should be agreed with the RPA. 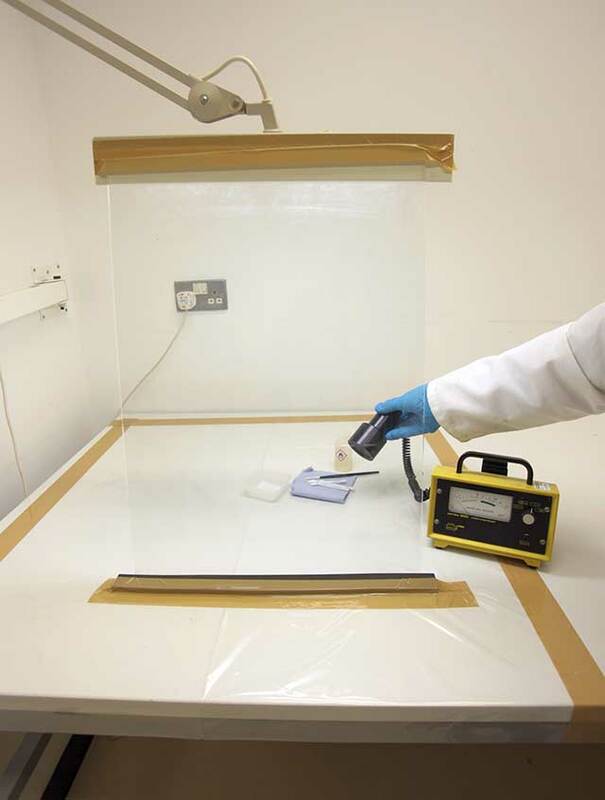 It is a legal requirement to do “leak tests” of sealed radiation sources to ensure the radioactive material is properly contained (IRR17 Regulation 28). This is also a contamination check when items are unsealed or partially sealed. The tests should be done at least every two years, or more often if appropriate. As with audit, the frequency is somewhat discretionary, but based on risk assessment by the RPA. Specifications for standard leak testing may not be applicable to museum artefacts, so the Polar Museum meets the requirement by doing an annual visual inspection with testing for contamination. The objects are examined for new damage, flaking paint or losses, and then checked for contamination. In most cases the radioactive component is behind glass and inaccessible, so objects are checked around seals and hinges where contamination from deteriorating radium paint may leak out. A radiation monitor (see section 6.2) placed by the object shows radioactivity from the source itself, so to test for contamination a tissue swab very lightly moistened with deionised water is passed across the surface and checked for radiation away from the object. For geological specimens only a visual inspection for losses is needed, since the whole surface of the object is radioactive and unsealed. A moistened tissue swab is also used to check for contamination in the object packaging. Apparent contamination is sometimes caused by daughter products of radon building up in packaging around the object (see Figure 4). These decay very quickly and disappear if the package is well ventilated, so leaving the object open to air and checking again after a couple of days confirms whether “contamination” is real or not. If high radiation readings persist then the RPA should be informed so the issue can be addressed. If there were simply daughter products of radon in the packaging then objects can be returned to the store without further action (see also section 7.5). The results of the visual inspection (including details of any elevated readings) are recorded on a table exported from the collections management database, then signed and dated. As with auditing, this leak testing method is only practical because the collection at the Polar Museum is small. Exposure to the artefacts does not exceed one hour for the whole procedure, once a year. A radiation monitor (sometimes popularly called a Geiger counter) is not essential in a small museum but is useful for checking for contamination and to identify “suspicious” objects as radioactive. The Polar Museum has a Mini-L 900 Type E monitor to check for contamination during the annual visual inspection, and also to check surfaces, clothing and hands for contamination after any procedure involving radioactive artefacts. The monitor is serviced and tested annually by the University Safety Office, as required under IRR17. Monitors vary in sensitivity and the type of radiation they can detect. The Polar Museum monitor is well suited to checking for radium contamination, but is not suitable for all object types and cannot quantify radioactivity. The RPA is the best person to measure activity levels accurately when necessary, and can also advise on buying and maintaining the right monitor. Preventing accidental or unnecessary radiation exposures. Radioactive contamination in the environment can have disastrous long term consequences. This is why good security for radioactive collections is a legal requirement under both IRR17 and EPR16. Security measures need to be appropriate to the sources and their activity, and a reasonable level of security is an EPR16 requirement whether the collection requires a permit or not. For sources normally held by museums “Good” museum security as defined in Benchmarks in Collections Care 2.0 (MLA 2011) will be sufficient. While highly radioactive collections must be kept in separate, secure rooms, this is not essential for less active objects. Space in museum stores is often limited, but a small radioactive collection can sometimes be housed in a larger general storage area (for examples see Freedman 2011, and Kerbey and Horak 2006). However, the RPA must approve the designation and safe access arrangements to prevent accidental or unnecessary exposure of staff, volunteers, visitors or students to radiation. A zone can be cordoned off around the collection to keep people far enough away to have no effective exposure (see also IRR17 Regulation 19), and this zone may become a controlled area with local rules to ensure safe working practices for everyone using the store. The controlled area should be in a little-visited area away from study or work spaces, or corridors where people regularly pass close by. Good signage is essential so everyone can see where radioactive hazards are and avoid them. There should be trefoil warning signs in the relevant part of the store and on the artefacts and/or their containers as well (examples are shown in Figure 5). Contact details for the RPS should be displayed prominently by the radioactive collection. Everyone with access to the store should know about the hazard and how to avoid it, and this should be a standing item in the induction for any new staff, volunteers or students who might be affected. Contractors and out-of-hours staff (cleaners, security guards) should also be made aware as appropriate. The RPA will advise on arrangements to make sure they are adequate (see also sections 5.1 and 5.2 on Local Rules and Risk Assessment) and the RPS/ local managers are responsible for checking that they are properly implemented. New packaging method in polypropylene trays lined with acid-free tissue. Each container and artefact label is marked with the trefoil sign as required under EPR16. ©Scott Polar Research Institute, University of Cambridge. Radon is produced during decay of radioactive materials and is a health hazard in its own right (see Figure 4). Many museums have stores in basements which often have elevated background radon because of naturally-occurring radioactive materials in ground and building materials (even in “non-radon-affected” areas), but storing radioactive artefacts in any space also raises the radon level. It is important to do a radon survey in the area where radioactive objects are kept and repeat it every 5 years, or more often if the collection grows, or the building/patterns of use change significantly. Radon levels can be measured using radon monitors which are available from the Public Health England UKRadon website for about £20–£25 each (UKRadon). The RPA can advise on how many are needed for a useful survey and where to place them. Radon monitors are sent by post and should be positioned immediately. They stay in one place for three months before being returned. UKRadon analyse and report on the results and advise if action is needed. UKRadon should be informed which monitors have been in storage areas with radioactive objects so they can make appropriate recommendations. Radon levels are measured in Bq/m3, and under IRR17 there is an “action threshold” of 300 Bq/m3 averaged over a year. If radon levels exceed this, the employer is legally obliged to act to reduce radon (UKRadon). One very effective solution is to provide good ventilation. Radon decays in just a few days but is regularly replenished, so ensuring plenty of air exchange by ventilation helps lower the levels. It is tempting to keep many radioactive artefacts together to “contain the problem” in one place. But concentrating artefacts in a single space can lead to unacceptable radon levels. Dividing the collection into different areas may be another way to keep radon below the action threshold, as long as the same principles of ALARP apply in all the storage spaces (see section 7.1). The action threshold for radon in the UK may be reduced in the future, so museums must stay aware of changes in legislation which may affect their storage areas. The Polar Museum radioactive collection is stored in a separate room alongside radioactive sources used in scientific research. This room is designated as a controlled area and is only accessible to trained individuals. The Polar Museum shares an Environment Agency permit with the Whipple Museum, another University of Cambridge museum with a similar collection of radium-painted objects. The Whipple Museum collection was originally housed in a large general storage room in a cordoned-off area, close to a ventilator to keep radon levels down. While the Whipple Museum storage arrangements were completely acceptable in terms of radiation safety, there were very limited options for ventilating the store. The collection also included deteriorating plastics requiring ventilation because they were emitting acidic vapours. The shortage of ventilated space meant that both collections were very close together and acidic vapour from the plastics was detrimental to the predominantly metal radioactive items. Since the Whipple and Polar Museums already held a joint permit for their collections, it was decided that the Whipple collection would be better preserved if it was physically housed in the same place as the Polar Museum objects (although still owned by the Whipple Museum). This was arranged as a long-term loan agreement between the two museums so it can be changed easily if necessary. It was anticipated that radon levels would rise when the collections were housed together, and a recent radon survey after the new objects arrived showed that this has happened. Although occupancy of the storage area is very low, ventilation in the space is being upgraded with a more powerful fan, and once this has been done another radon survey will be needed to monitor the new level. When the radioactive artefacts at the Polar Museum were first identified, they were all housed in acid-free cardboard trays. The University RPA at the time consulted the Environment Agency, who advised that each object was double-bagged in two polyethylene bags, as in similar museum collections (for example, the neighbouring Imperial War Museum at Duxford). This allowed individual objects to be picked up by the edge of the bag to reduce hand exposure from direct handling. The double bag was intended to protect against contamination from losses of radioactive material even if the outer bag was damaged. It would also contain the object and minimise contamination if it were dropped and broken. In practice this system caused problems during the annual visual inspection to assess condition. The double bags were difficult to see through, so the RPS either risked peering too closely at the object and getting an elevated eye dose, or handling objects excessively to get them out of the bag for inspection. Another problem was that sealed bags did not allow good airflow round the objects, so radon accumulated inside the bags and “daughter products” built up on the inner surfaces of the polyethylene. When the inside of the bag was swabbed during a visual inspection, daughter products were indistinguishable from contamination from deteriorating artefacts. The bags had to be left open for a few days to allow the short-lived daughter products to disperse and then rechecked. This made the process of visual inspection inefficient and again, increased staff exposure to the artefacts. To solve these problems, the artefacts were re-housed in open polyester or polypropylene boxes without lids (see Figure 5). The boxes still allow objects to be handled from a distance to minimise hand doses, but it is much easier to assess the condition of the artefacts quickly and safely. The trays also completely prevent build-up of daughter products of radon. The boxes are lined with acid-free tissue which provides better cushioning, and also shows up losses very clearly. The main disadvantage of this housing method is that if there were a breakage, the boxes would not contain the object fragments. To minimise this risk the local rules and risk assessments have been adjusted to stipulate that objects should not be carried manually through work areas, but always transported on trolleys. Radioactive objects can be displayed if there is great care to keep radiation doses to a minimum. Because of the security risk and concerns about exposing the public and museum staff and volunteers, display is normally only appropriate for objects with low activity, and an RPA must be consulted. A robust risk assessment will determine whether a given object can be on display temporarily or permanently, and as always much depends on the specific radionuclide and its activity. The Polar Museum mounted a temporary exhibition for four months in 2011, featuring three mildly radioactive compasses. They were displayed in cases with laminated glass 11 mm thick, which partially shields the public from beta and low-energy gamma radiation. Radiation levels on the outer surfaces of the display case were measured with the compasses in place, and possible exposures for the public calculated as part of the risk assessment. The risk assessment assumed a “worst-case scenario” where a member of the public visited the exhibition twice a week every week for the whole period of the exhibition, each time spending ten whole minutes looking at the compasses while placing their hands on the display case as close as possible to the radioactive sources (this scenario was based on observations of public behaviour by museum staff). The statutory limit for a whole-body dose for a member of the public in a single year is 1 mSv (or 1000 μSv) (IRR17 Schedule 3 paragraph 5), and the extremity dose limit is 50 mSv annually (i.e. dose to hands or fingers) (IRR17 Schedule 3 paragraph 7). In the “worst-case scenario” of 24 visits of 10 minutes each, the Polar Museum exhibition visitor would be exposed to 1% of the annual radiation whole-body dose limit, and less than half of one thousandth of the annual extremity dose limit. Distance was also used to reduce exposure by setting the compasses as far back in the case as possible to reduce the dose, even for people pressing their faces against the glass. The most active compass was displayed furthest away from the glass for this reason. During the exhibition, the Polar Museum did not include the compasses on any tour or trail to avoid encouraging lengthy stays near the radiation sources. Other aspects of the exhibition design were also considered. There was enough space around radiation sources on display that visitors were not forced to stand close to them while looking at other exhibits. The design of some display cases meant children could crawl under them, unwittingly going closer to the radioactive source than an average visitor and getting a higher dose. This kind of access was blocked. Freestanding cases were pushed against a wall to minimise access around the radiation sources. The issue of signage is complex. The radiation dose from the display at the Polar Museum was so low that there was no legal obligation to mark it with a trefoil sign visible to members of the public. The “radioactive” sign may cause anxiety and also create a security risk by encouraging theft. Because radioactivity was not an important point in the exhibition and it was not required to put the radiation sign on public display, the museum did not do so. However, for members of staff possibly opening display cases or contractors going behind or under them there may be a slightly elevated exposure risk. For their benefit objects were therefore marked with a trefoil sign away from public view. As a requirement of EPR16, the “container” (display cabinet) was also labelled, with warning signs placed behind access panels and by display case locks to prevent accidental exposure. Arguably the greatest risk when displaying radioactive items is during installation and de-installation while objects are being handled. At the Polar Museum, these activities are carefully planned and carried out to minimise risk of accident and the number of people exposed to a radiation dose. Procedures are also in place to contain contamination in case of a breakage (see also section 11). During a routine inspection of the Polar Museum collection in 2016, a handheld compass from the 1950’s was found to be contaminated. 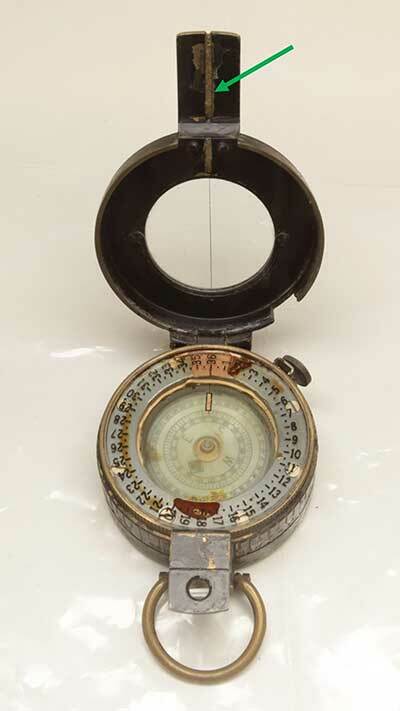 The compass had a hinged lid with a radium-painted sight-line inside the lid (see Figure 6). The paint was crumbling and a small amount of contamination was starting to leak under the lid onto the sides of the compass. The deteriorating radium-painted compass before treatment. The painted area is a sight line on the inside of the lid, and contamination has spread over the glass. ©Scott Polar Research Institute, University of Cambridge. Dispose of the compass entirely. This would remove the contamination problem, but the compass would also be completely lost. Furthermore, legal and appropriate disposal was expected to cost about £3000 for a compass containing this amount of radium-226. Removal of the radium paint while preserving the compass. Removing the paint completely by chipping or grinding out would be difficult without causing a lot of contamination and/or damage to the compass. It was impossible to find any contractor able to undertake this work, so this option was ruled out as impractical. Consolidating the radium paint using an archival adhesive. Consultation showed conservators in the UK and overseas had successfully treated similar problems. Although the lifespan of the treatment was uncertain, consolidating the paint would allow the compass to be retained for some years. This was the preferred option. The Smithsonian Museum of Air and Space advised that they have successfully consolidated radium paint with 5–10% w/v solutions of Paraloid B72 (methyl acrylate ethyl methacrylate copolymer). Their experience is very usefully discussed in Norquest et al (2015). At the Canadian Conservation Institute, a very similar object was treated by coating the flaking paint with a 20–30% solution of Paraloid B72 (Zweifel 2016). It was decided to consolidate the paint to bind it completely, rather than coat it with a stronger solution and risk future loss from deterioration of unbound areas under the coating. Instead of spending time testing different concentrations and greatly increasing radiation exposure, a relatively strong solution of 10% Paraloid B72 was chosen. Although this might darken the paint, preventing future losses took priority over aesthetic considerations. The radium painted sight-line would be consolidated with 2 coats of 10% Paraloid B72 in acetone, applied by brush with an interval of 1 hour between coats. Surface contamination would be removed with lightly moistened swabs of deionised water, and the surface dried with dry swabs. The work-room was made a controlled area during treatment to prevent accidental or unnecessary radiation exposures. The workbench was covered with a generous sheet of heavy-duty polyethylene taped down at the sides and completely covering the front edge of the bench. This liner contained all tools, equipment and waste during treatment, as well as the artefact itself, to prevent contamination of the workbench. All tools and solutions were prepared and laid out before the compass was brought into the workspace to keep exposure as short as possible. Tools and containers were disposable as it was assumed all would be contaminated by radium during treatment. Tiny quantities of solutions were used to minimise contaminated waste. About 10 ml of B72 solution in a polypropylene bottle was used for treatment, deionised water for swabbing was placed in a disposable plastic tray; cotton-wool buds and a cheap nylon brush were used for consolidation and cleaning, and disposable plastic tweezers were used for manipulating swabs and the artefact when necessary. Risk assessment showed that the greatest danger was a speck of paint accidentally being inhaled or ingested during treatment. To avoid this, a Perspex screen was secured between the task light and the table (see Figure 7). The conservator wore a lab coat to protect her clothes from contamination. She also wore a disposable polyethylene apron, and nitrile gloves. The gloves and apron were removed and bagged immediately after each treatment phase to avoid transferring contamination onto door handles or other surfaces. Fresh gloves and apron were used for each new treatment phase, and a radiation monitor used to check for contamination on hands and body at the end of each stage. The compass was minimally handled during treatment, and whenever possible tools were used to maximise distance between the conservator’s hands and the radiation source. The cotton-wool swabs were double-ended, but were discarded after using just one end to prevent contaminated cotton-wool from touching the conservator’s gloves. Photos were taken between treatment stages to avoid possibly contaminating the camera. After treatment all tools, used gloves, aprons, solution bottles etc. were rolled up in the polyethylene liner and double-bagged to await disposal. Ventilation was kept running and the room remained a controlled area until all waste was removed. The worktop, Perspex screen, camera, and conservator herself were all checked again for contamination after treatment. The treatment setup for conservation of the deteriorated radium-painted compass, showing the Perspex shield, table covering, disposable cleaning and treatment materials and radiation monitor to check for contamination. ©Scott Polar Research Institute, University of Cambridge. Total time taken for the treatment was half an hour and setting up the conservation lab beforehand also took about half an hour. The risk assessment and documentation for the museum management committee took a further 3 hours and proved time-consuming because this was not a routine activity. A small amount of radioactive waste was produced, which was removed free-of-charge by the University. Arranging for correct waste disposal also took about an hour. Overall, less than 20% of the time spent on this project was treatment time and the rest was spent ensuring safe working and legal compliance. It is illegal to transport radioactive material on a public road in the UK without complying with the Carriage of Dangerous Goods and Use of Transportable Pressure Equipment Regulations 2009 (CDG 2009), based on the European Agreement concerning the International Carriage of Dangerous Goods by Road 2015 (ADR) (United Nations 2015). These require correct packaging and labelling of objects, training for the driver/courier, and legally compliant paperwork for the journey. The law applies no matter how short or long the journey, although requirements vary according to the activity of material. For international journeys the rules are more complex. In practice, the Polar Museum has arranged transport within the UK when returning items after long term loan and when moving objects from one building to another (Rowe 2017). Arranging radioactive consignments is unlikely to be a routine task for a museum RPS with a small collection, so the RPA should be consulted in plenty of time to plan the transport and potentially appoint a specialist courier. Local rules for managing radioactive collections should include measures for accidents or emergencies, which should be integrated into the general emergency plan for the museum. The guidance notes for IRR17 regulation 13 outline what should be included in the contingency plan, and the RPA should be consulted for advice. The location of radioactive collections should be clearly marked on site plans for use in an emergency, and key contacts (including the RPA) should be in the emergency plan for the museum. If a disaster results in radioactive contamination, for example from broken objects, the HSE must be informed (IRR17 Regulation 31) and sometimes the Environment Agency, too (EPR16 p. 216–7). It is very unlikely that small museums will need to comply with the Radiation (Emergency Preparedness and Public Information) Regulations 2001 (REPPIR), as quantities of radioactive material will be well below the regulation thresholds. For example, the threshold for radium-226 is 2000 MBq, which would only be exceeded by very large collections. However, IRR17 requires rehearsals of contingency arrangements for radioactive material (Regulation 13(2)). A useful way to do this is to include the radioactive artefacts in a table-top exercise to test the museum emergency plan. Radioactive artefacts may need to be de-accessioned, either on safety grounds or if they fall outside the museum’s collection policy. As with any disposal, de-accessioning a radioactive object must be done ethically with due process, according to the SPECTRUM 5.0 standard (Collections Trust 2017). If the object is passed to another institution or individual the museum must ensure it will be correctly managed by the future owner before physically transferring it to them. Destroying a radioactive artefact must be done through an appropriate waste contractor. Different firms can manage different types of waste, and the required type of disposal and cost will vary according to the object. The cost may be quite high, for example the cost of disposal for a radium-painted compass with an activity of 0.8 MBq was estimated at £3000 based on 2011 figures, and costs may rise unpredictably in future. The RPA/RWA can advise on disposing of specific items, and appointing a waste contractor. While it can seem daunting when first confronted with a radioactive collection, managing small groups of these objects need not be onerous once systems are established. A good working relationship and regular contact with an RPA is crucial, to ensure the artefacts are managed correctly and also reassure the museum RPS. It is important to do routine checks, review risk assessments and local rules annually and have regular refresher training. It is even more important to keep clear and up-to-date records of these things, so that during any Environment Agency or HSE inspection it is easy to demonstrate good practice. Good planning and allowing plenty of time for tasks is also essential in managing radioactive collections. Acting too hastily and without enough consultation is possibly the greatest risk factor in any work involving such artefacts. If in doubt, always consider ALARP first and then consult the RPA. I am very grateful for the excellent support of the University of Cambridge Safety Office radiation team, past and present. I am also grateful to the other SPRI RPS’s, Ian Willis and Liz Morris and my colleagues Charlotte Connelly, Fiona Craig, Willow Silvani and Kate Gilbert, for their practical help in managing the radioactive collection over the last five years. Steve Kruse and Claire Wallace of the Whipple Museum of the History of Science were very helpful in arranging shared storage of the Whipple and Polar Museum collections. Finally, many thanks to Sharon Norquest of the Smithsonian Museum of Air and Space for help with enquiries about treating radium painted artefacts. The author’s post is funded by the United Kingdom Antarctic Heritage Trust. Boyle, A. 2003. Uranium hunter follows trail of tiles. NBC News 30 May 2003. Available at: http://www.nbcnews.com/id/3077213/ns/technology_and_science-science/t/uranium-hunter-follows-trail-tiles/#.W4VevvlKiUl [Last accessed 28 August 2018]. Carriage of Dangerous Goods and Use of Transportable Pressure Equipment Regulations. 2009. Available at: http://www.legislation.gov.uk/uksi/2009/1348/contents/made [Last accessed 15 December 2017]. Collections Trust. 2017. Spectrum standard 5.0. Available at: http://collectionstrust.org.uk/resource/deaccessioning-and-disposal-the-spectrum-standard/ [Last accessed 15 December 2017]. Environmental Permitting Regulations. 2016. Available at: http://www.legislation.gov.uk/uksi/2016/1154/pdfs/uksi_20161154_en.pdf [Last accessed 15 December 2017]. Freedman, J. 2011. Storage of the radioactive mineral collections at Plymouth City Museum and Art Gallery, UK. Collections: A journal for museums and archives professionals, 7(2): 201–212. Goodman, TR. 2010. Ionizing radiation effects and their risk to humans. American College of Radiology Image Wisely campaign. Available from: https://www.imagewisely.org/-/media/ImageWisely-Files/Imaging-Physicians/IW-Goodman-Ionizing-Radiation-Effects.pdf [Last accessed 28 august 2018]. Health and Safety Executive. 2017. L121 Draft Ionising Radiations Regulations 2017. Available at: http://www.hse.gov.uk/pubns/priced/l121.pdf [Last accessed 22 February 2018]. Kerbey, HC and Horák, JM. 2006. Maintaining standards in the care of petrology and mineralogy collections in the National Museum of Wales. Collection forum, 21(1–2): 42–57. Museums and Libraries Association. 2011. Benchmarks in collections care 2.0. Available at: http://collectionstrust.org.uk/resource/benchmarks-in-collections-care-2-0/ [Last accessed 15 December 2017]. Norquest, S, Kile, A and Peters, D. 2015. Working with a collection of radioactive aircraft instruments. In: Objects Specialty Group Post prints, 22: 169–180. American Institute for Conservation of Historic and Artistic Works: Washington, DC. Available at: http://resources.conservation-us.org/osg-postprints/wp-content/uploads/sites/8/2015/05/osg022-11.pdf [Last accessed 22 February 2018]. Radiation (Emergency Preparedness and Public Information) Regulations. 2001. Available at: http://www.legislation.gov.uk/uksi/2001/2975/contents/made [Last accessed 15 December 2017]. Radioactive Substances Act. 1993. Available at: https://www.legislation.gov.uk/ukpga/1993/12/contents [Last accessed 22 February 2018]. Rowe, S. 2017. A trouble shared is a trouble halved. Available at: http://www.museums.cam.ac.uk/blog/2017/01/06/a-trouble-shared-is-a-trouble-halved/ [Last accessed 15 December 2017]. Spory, G. 2012. Memories of my father, Philip Spory, a watchmaker. NAWCC Watch and Clock Bulletin, 396. Available at: http://docs.nawcc.org/Bulletins/2010/articles/2012/396/396_144_148.pdf [Last accessed 28 August 2018]. Swift, R, Meek, AS, Rode, N and Komlosy, A. 2012. A radioactive shamanic apron with glass disease. British Museum Technical Bulletin, 6: 25–32. Available at: https://www.britishmuseum.org/pdf/BMTRB_6_Swift-et-al.pdf [Last accessed 15 December 2017]. UK Environment Agencies. 2011. Exemption guidance: radioactivity in museums. Available at: https://www.gov.uk/government/uploads/system/uploads/attachment_data/file/296434/geho0911buem-e-e.pdf [Last accessed 15 December 2017]. UK Radon. http://www.ukradon.org [Last accessed 15 December 2017]. United Nations. 2015. European Agreement concerning the International Carriage of Dangerous Goods by Road. Available at: http://www.unece.org/trans/danger/publi/adr/adr2015/15contentse.html [Last accessed 15 December 2017]. Vandiver, PB. 1995. Corrosion of synthesized glasses and glazes as analogs for nuclear waste glass degradation. In: Materials Research Society Symposium Proceedings, 352: 395–412. Available at: https://www.cambridge.org/core/services/aop-cambridge-core/content/view/BF4F81D0B08D8710B54CCB1102270755/S1946427400364491a.pdf/div-class-title-corrosion-of-synthesized-glasses-and-glazes-as-analogs-for-nuclear-waste-glass-degradation-div.pdf [Last accessed 22 February 2018]. Watson, S, Jones, AL, Oatway, WB and Hughes, JS. 2005. Ionising radiation exposure of the UK population: 2005 Review. Health Protection Agency: Chilton, UK. Available at: https://assets.publishing.service.gov.uk/government/uploads/system/uploads/attachment_data/file/340209/HpaRpd001.pdf [Last accessed 28 August 2018]. Yates, L. 2015. An introduction to safe handling of radium items and naturally occurring radioactive materials (NORM): Core training for users and supervisors. University of Cambridge internal training course delivered 21.5.2015. Unpublished. Zweifel, S. 2016. Conservation of radioactive objects. Archived mailing list post. Available at: http://cool.conservation-us.org/byform/mailing-lists/cdl/2016/0720.html [Last accessed 28 August 2018].